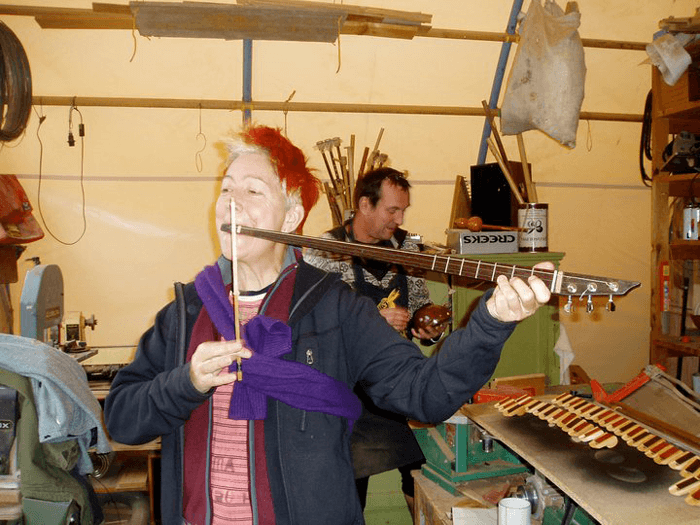 An invitation to improvise and collaborate on the creation of soundworks emerging from ‘playing the landscape’ and the environment of the Delphi/Amfissa. Locations and times may be multiple enabling as many participants as possible, within time and event constraints. Samples could be recorded, mixed and played at convenient junctures if so desired. A final performance could be played live, or could be listened to as a prerecorded performance piece after 2 – 3 days experimentation (these need not be whole days – perhaps 2 – 3 hours per day, for example). We will discuss and visit possible locations local. A variety of ‘beaters’ will be provided and we will find others in the landscape during the workshops. Playing the Landscape, is an ongoing sound project conceived of by Dr. Hilary Ramsden and developed in collaboration with musician, Heather Summers and theatre-music company h2 (hSquared). Playing the Landscape seeks to detect, investigate, improvise and record sounds within a variety of ‘scapes’ in order to excavate meanings and notions of place, identity, belonging and memory. The project began in 2008 in Manchester, UK as a literal playing of outdoor sculptures using a variety of beaters (such as drumsticks and xylophone sticks) in order to add an audio dimension to what were considered to be visual art pieces. This work developed into a wider concept of ‘playing’ other elements within the environment, integrating ambient and found sounds. Since then we have ‘played’ a telephone exchange, and our local school.